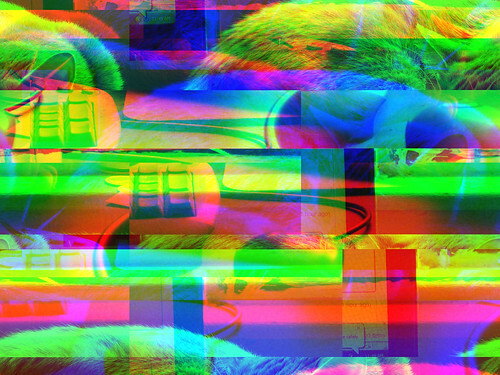 welcome to part 2 of my databending primer! 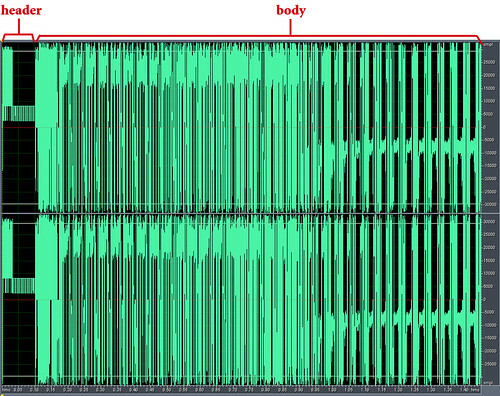 sorry about the lengthy delay between part 1 of this primer and part 2. if you haven't already read part 1, you may want to do so, as part 2 depends on various terms and concepts that were introduced in part 1.
this part is about sonification, and about databending with audio software. i'll show you how to coax databent sounds out of your windows hard drive using a type of audio software called a wav editor. then, i'll give you some tips for using the wav editor to create databent images. sonification, put simply, is the act of converting data into sound. wikipedia points to some well-known examples, such as the geiger counter and sonar. it's an extremely broad field; here i'll be focusing on sonification in a databending context, or using sonification techniques to create art. my first exposure to databending came in 1995 or '96. i'd been using a tracker program called scream tracker to create music on my computer, but scream tracker used an obscure file format for its audio samples. i wanted to be able to record my own sounds and sequence them, so i switched to a program called impulse tracker. quickly i discovered that impulse tracker not only let me use wav files, but it let me open up any file on my hard drive as if it were a sound file, and then play and sequence the sounds. i was immediately hooked, and a couple years later i'd write & record an all-databending EP using impulse tracker: dissonance is bliss. 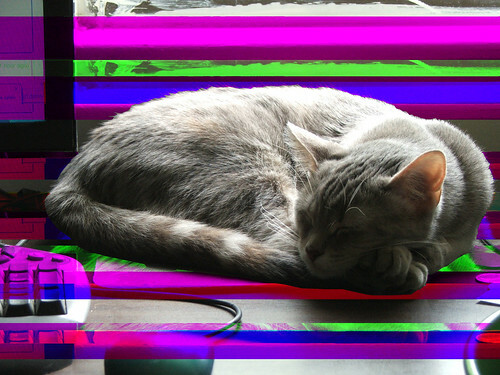 obviously, i'm still databending today, though i've since moved on to other software. if you have programming/software development skills, then the potential here is pretty limitless: you can sonify data in any way you can imagine. for the purposes of this primer, i'll be using off-the-shelf or freely available software. one simple way to sonify data is to convert it to MIDI. MIDI (musical instrument digital interface) is a language that computers and synthesizers use to communicate with each other. if you're a musician who uses MIDI in your setup, you could use programs like GoMinimal!, Midifier, Midge, or GMC to generate an endless amount of "random" MIDI files. personally i've never had much use for MIDI, myself. also, you can use programs like voice (and the java applet version) to "draw" sounds, somewhat similar to xenakis's UPIC system. and programs like metasynth and coagula can be used to do fun stuff like hiding pictures in your sounds to be viewable with a spectrograph. but these aren't exactly databending, at least not by my definition. the unix and linux operating systems provide perhaps the easiest way to sonify data: piping data directly to the sound card. a wav editor is an application for recording waveform audio. you can think of the waveform as being as being a digital representation of a sound wave. the wav format is at the center of windows audio—when you rip a cd to mp3, you're actually ripping it to wav first, and then encoding mp3s based on those wavs. so how do you open a non-audio file using a wav editor? if you read part 1 of this primer then you may have already figured this part out. sonifying data in a wav editor is as easy as clicking "open"! here, you can just accept the defaults, or play around with them. the settings you choose will affect what your file sounds like. for example, increasing the sample rate will make your sound shorter (faster) and higher in pitch; decreasing the sample rate will make the sound longer and lower. once you've made your selections, click OK, and your data file will be converted into a waveform. congratulations! you can now resave your file in WAV format and do whatever you want to it: sequence it, run effects on it, whatever! 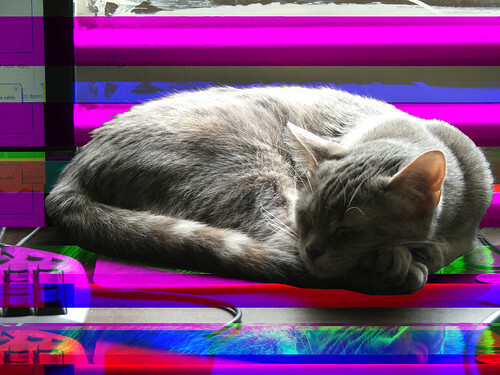 patience is a virtue when it comes to databending. the range of sounds you can find are virtually limitless, but actually finding them will take time—your hard drive may have millions of files on it, so it will take time to find the best-sounding ones. the types of sounds you're most likely to find are slightly distorted "electronic" sounds. if you're old (or unfortunate) enough to be familiar with the sound a dial-up modem makes as it connects to the internet, then you'll find a lot of sounds like that. databent sounds could also be compared to 8-bit or chiptune sounds. so what types of data sound good when sonified? obviously, this is subjective, but here are some tips. compressed files generally just sound like static or white noise. this is because of how file compression works: all the relevant data is smooshed together as much as possible, so any patterns in the original data are lost. if you're looking for white noise (maybe as a background texture, or maybe you just want a fraction of a second to create hihat-like sounds with), they're great, but they're generally not of much use to me. examples of compressed files include ZIP, tarball, RAR, cabinet files (CAB), as well as compressed image formats such as JPG and PNG. also, most video file formats are compressed. small files become really short sounds—percussive sounds or clicks. 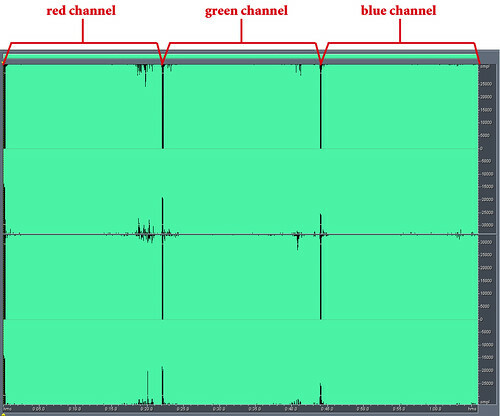 this is obvious if you think about it: a cd-quality sound file uses 44,100 samples per second for each channel (stereo sounds have two channels), so that's a lot of data just for one second of sound. uncompressed image files including bitmaps (BMP, most TIF), photoshop and image-editor-native formats (PSD, RAW, etc) can be a source of all sorts of interesting sounds. executable files (EXE, etc) sometimes sound good, or sometimes sound like compressed files—just a bunch of static. these are just some ideas; there are thousands of different file formats out there, created by all sorts of programs, and you may have something amazing on your hard drive that i've never heard of. as i said before, finding great sounds requires lots of patience. for a taste of what kinds of sounds you can find when databending, check out my true data 12" (stream it on soundcloud, buy the vinyl here), or download my aforementioned databending EP, dissonance is bliss, which is available for free download starting today. every sound in tracks 1-7 (aside from the vocal samples) was a file on my hard drive. wav editors aren't the ideal image-bending environment for a number of reasons, but they do offer several unique advantages. first and foremost, they enable you to make dramatic changes using visual cues, in a way that would be difficult if not impossible in other environments. as usual, you generally want to avoid bending the header, but the body of the data is fair game (assuming you're working with bitmaps like BMP, TIF, or RAW). those are all super-simple bends, using only cut and paste with only one source image. you can switch it up by using multiple source images, including other effects and rotation... whatever you can imagine. never bend the header. the only time i've ever found it advisable to alter a file header is when bending the color table of a file that uses indexed color (namely, GIF and 8-bit BMP). so don't do it. don't add or subtract bytes. many image formats specify their exact size in the header, and if the actual size of the file is off even slightly, they won't open. so you must be very careful that your file has the correct amount of data. i usually do this by only using cut and paste, and always being sure to paste (once, and only once) every time i cut something to the clipboard. another way is to pay close attention to exactly how long your selection is, and make sure you don't paste too much/too little data. try tiny cuts. even minor changes can have major effects when working with these file formats, so try making changes of just a fraction of a second, or move things around but move them just a little bit. files that don't open in one app may open in another. photoshop isn't very good at opening corrupted JPGs. the gimp is much more flexible, as is microsoft paint. if you don't seem to be having any luck, try opening your bent files in another app. also, the same file may render differently in different applications or on different hardware. so if you have two applications that will open bent JPGs, try using both—you may get different results. your file may still break. even if you do everything right, you may end up cutting the wrong byte or pasting it into the wrong place, making it refuse to open. just be patient and never, ever bend your originals! always, always make a copy of your image, and bend only the copy. all the rules from the previous section apply to photoshop's native format—PSD. 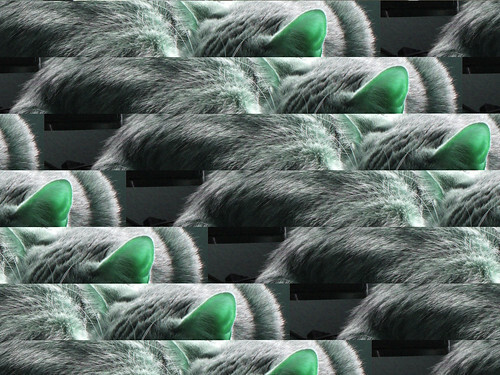 but in addition to the header, PSD (photoshop) files have a patch of must-not-bend data in between each channel. furthermore, the rule for not adding/subtracting byte applies to each channel of a PSD file. since it can be impossible to tell exactly where a channel begins or ends, you should expect these files to break frequently. another trick involving layers is to use duplicate layers. 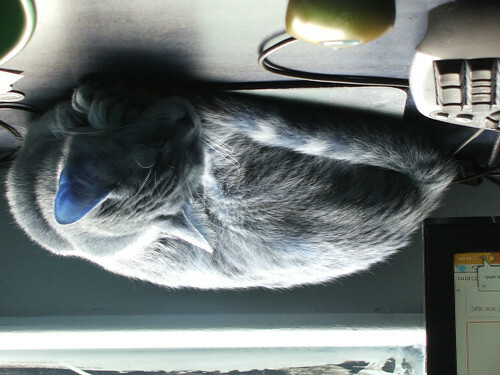 if you copy an image to a second layer, and then bend the file, you can effectively create two databent copies of the image, simultaneously. of course, this also gives you more opportunities to mess up and break the file. if that isn't weird enough, i've found that the same version of photoshop running on different hardware will render differently, and you'll even get different results from the same version running on the same hardware but on a different windows installation! 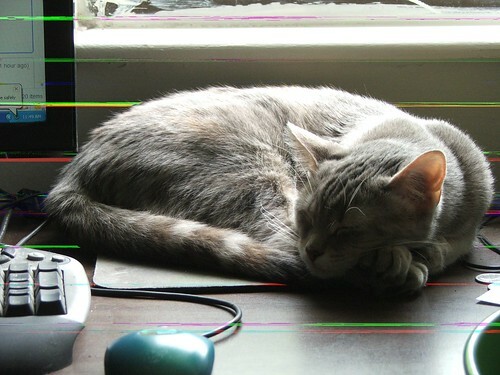 instead of the horizontal banding effect we see in photoshop, gimp treats bent PSD files much like a photoshop RAW file or non-interleaved TIF. (in my experience, different versions of gimp all render the same.) for this file, i made tiny cuts as mentioned above, which resulted in major changes in photoshop, but only subtle glitches in gimp. 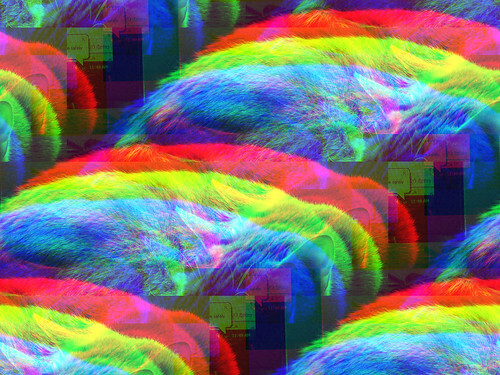 why these applications render the same file differently is a mystery that hasn't been solved, but you can use this to become highly productive at databending. 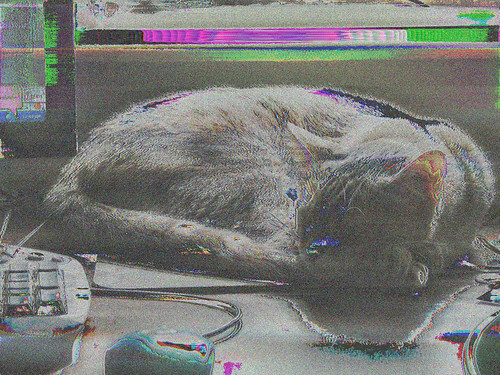 by installing multiple versions of photoshop as well as gimp, you can glitch a file once and get 3-4 databent images out of it. by glitching a multiple-layered PSD file and opening it in multiple applications, you can create 6, 9, or more databent images at once. add a second computer into the mix and you could do even more. so that wraps up part 2. we briefly discussed various types of sonification, and i showed you how to open your files in a wav editor and make music out of them. we then discussed databending image files using a wav editor, with some specific tips for editing PSD files. the plan is for part 3 of the primer to be about reinterpretation—using photoshop to open non-image files, the same way we used a wav editor to open non-audio files, and stuff like that. of course, considering it took me 10 months to post part 2 after posting part 1, it may be a long while before part 3 goes up. ben: are you using photoshop 6? i think daniel temkin has written about the effect you're discussing. hey stallio :) yep, looks like a variation on that! that's cool, thanks for pointing me to it. Yes, it was either with Photoshop 5 (i think) but possibly 6. I use 7 now but this gives me reason to consider reverting! I only really have access to audacity at the moment. Do you know how to save the file back as a bmp? assuming you opened the file in the manner i described, all you need to do is click "save". In audacity if you press ctrl+s it tries to save it as a project (.aup). I can't see a simple 'save' option. Any thoughts. i guess you could try "export as WAV" and then manually change the file extension to BMP. it might not work, but that may be your best shot in audacity. Nah, doesn't work, but thanks for the suggestion! Success! https://gna.org/projects/mhwaveedit/ Works perfectly! When saving just use RAW PCM as the format. The program is available in the ubuntu repository. I have a problem though, I am using Goldwave, I tried opening (TIF, BMP) files and I added the min. number of effects, yet the file still wont open even on Paint. it's hard to say, but my guess would be that you're bending the header or something else that shouldn't be bent. just keep trying is the only advice i can really give. Oh, rats. I'm going to have to find another audio host. Can anyone tell me where is the audio host? I'll post the music link again when I have one. Hi I'm currently using sonification in Goldwave for an art project on corrupting 3d modelling images. I've been using it for a month now but suddenly the software has started to automatically interpret the images as stereo audio files instead of mono and won't let me save them in their original format. Do you know why this is? i haven't used goldwave in a while... i would check your application settings to set your defaults to mono, and if that doesn't work, try uninstalling & reinstalling. I've been testing it out some more and it seems to only happen with very specific files with not any real connection between them. For example I exported 2 identical tifs from photoshop, one with layers and one without, and the one with layers is interpreted as stereo even though other layered Tif files have worked. Also I made the default assumption for TIFs mono but it still puts my image into stereo(this is after about a half an hour of stalling on the program though) Do you think theres other factors that could be affecting this like colours, lightness or alpha channels? This was really helpful. Thanks for this. 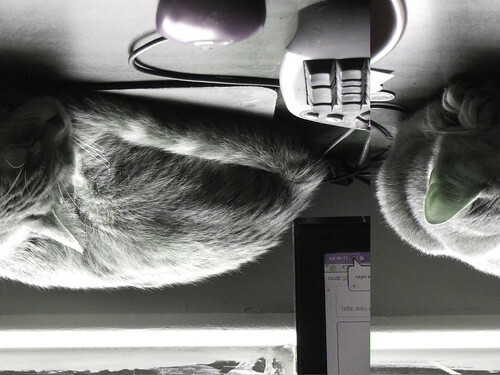 I have a question though, how come all my images turn out black & white in audacity? In PSC5, when opening a RAW, you can put a slightly smaller resolution. Photoshop will state the image resolution is smaller than the file size, but will let you "Open Anyways".